Tonight I did my weekly ritual of reading the new Look Magazine.. Painted my nails and I am still drooling over Blair's Wedding from Gossip Girl! 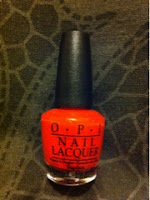 Decided to brighten up my nails with my favourite OPI Nail Polish, Cajun Shrimp. I got the 'Best of the Best Collection' for Christmas and they are fab! It's brings together 10 of OPI's best sellers and all of the colours are amazing! I had the large bottles of a few but it was also nice to try a few that I probably would normally have never picked up. Did any of you see the Wedding on Gossip Girl?? It was so beautiful.. Wasn't so sure about the minion's bridesmaid dresses but Serena's was stunning. 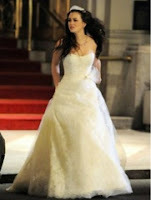 Blair's wedding dress was just amazing too.. Sent it to my BFF tonight as I can totally see her in something like that when she gets married! Without spoiling the ending for anyone I was very shocked and a little disappointed.. They need to just be together already!!! !